This past weekend, I was surprised by "The Ukrainian" with a trip to Santa Monica. I hadn't been there in more than a year. And also on my side was some nice weather. We went to the pier and Third Street Promenade, though apparently they closed the mall for renovations. 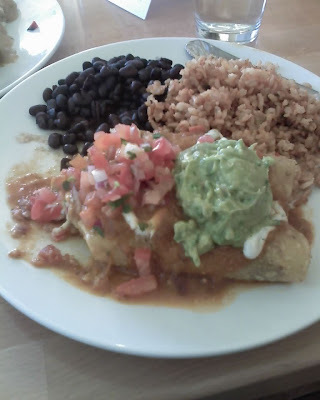 After a ton of walking, it was time for an early dinner, and I was taken to RFD (Real Food Daily), a vegan restaurant. The menu had a lot of appealing stuff on it (mostly sandwiches and salads), but since I don't get to eat Mexican food without stomach pain anymore due to my lactose intolerance, I decided on the enchilada plate pictured on the right. As you can see, it seemingly has all the fixings except for copious fake cheese and sour cream. There was a little of each, but not the drowning that I had wanted. Still, it tasted pretty darn close to the real thing, and I took a few bites before remembering to take a picture! 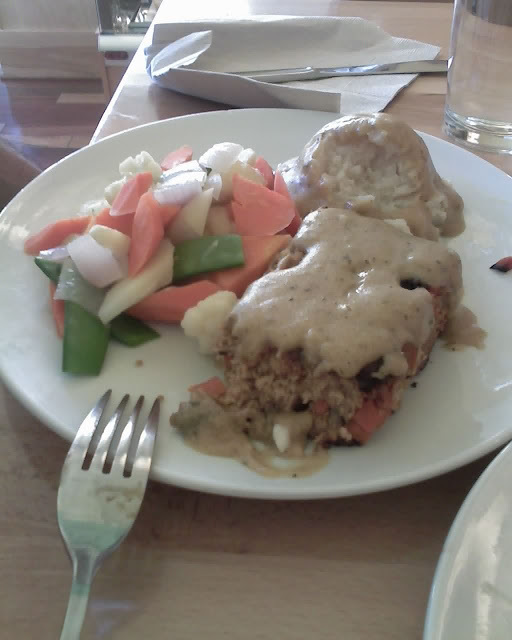 "The Ukrainian" got the "TV dinner," which is "meat"loaf, mashed potatoes, and veggies smothered in some sort of gravy. Again, very delicious. I think it was made out of tempeh and ground veggies. We also ended up sharing a "teaccuino" and chocolate peanut-butter cake slice, but I forgot to take a picture... d'oh! The drink was good, as it tasted a bit like coffee but was actually a blend of herb/nut/grain flavors. The cake was rich but not bloating. For once, I did not feel bloated or overly full after eating as much as we did. Unfortunately, we undid that when we went to a British pub after much more walking and had chips (aka fries) and vinegar and mustard, along with a cheese plate. I thought it was so sweet that my meat-eating dude sought this place out for me. I told him we needed to seek raw vegan food next, to which he actually agreed. On another note, running has been okay since the marathon just two weeks ago. I am having a hard time drawing up the will to do it on the weekends, but at least I get good 6-7 milers during the week for now. This week, I started adding speed and inclines to my workouts again. I need to be careful, since my legs have been showing slight signs of wear. I'm supposed to be running a 20-miler soon just for moral support. P.S. These photos were taken from my cell phone. Not bad, huh?